There is very little information about the Bernardon-Martin pistol in the English language literature. To his credit, Ian Hogg, in his book Pistols of the World, 2004 edition, provides four paragraphs about the gun, whereas a number of other English language sources for general information on guns, such as R.K. Wilson, W.H.B. Smith, Edward Ezell, and Geoffrey Boothroyd do not mention the gun at all. However, Hogg’s information is incomplete and not entirely accurate. The situation in French literature is only marginally better. Huon appears to have written his book Les Pistolets Automatiques Francais without a close examination of a Bernardon-Martin. Daniel Casanova’s article in Gazette des armes seems as if it is largely derived from Huon’s book, repeating the same inaccuracies, though it does offer some tidbits of additional information. The much earlier article by Bernard Meyer consistently misspells the name Bernardon and contains some dubious assertions. For new information we must rely on what we can deduce from examining the gun itself and the available patents. Thomas Martin is described by Huon as a gunsmith in Saint-Étienne, France. Étienne Bernardon is described by Huon as an arms manufacturer, also in Saint-Étienne. Martin filed for a patent on a self-loading “automatic” pistol design on 25 November 1905. French patent number 359992 was granted to him on 9 April 1906. He was also granted Austrian and British patents in 1906 for the same design (see patent information below). 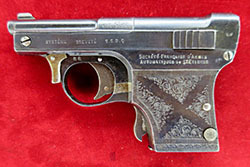 The Systeme Bernardon-Martin became the first commercially- produced French auto pistol. The guns were almost certainly hand assembled, with limited parts interchangeability. I should remind the reader what self-loading pistols were available and might have influenced a French gunsmith in 1905. Existing auto pistols included the 1893 Borchardt, various Bergmann pistols, the 1896 Mauser, the 1900 FN Browning, and the 1900 Mannlicher. The era of Spanish auto pistol production had not yet begun (or was only just beginning) so no Spanish influence is likely. Charles Clement of Belgium had taken out his first patent in 1903, but his guns do not appear to have influenced Martin. The 1900 through 1903 Colt pistols were on the market, but could not be sold in Europe. Production of the 1903 FN Browning “le Grand Modèle” didn’t actually begin until 1907. Hence, of Browning’s guns Martin probably had seen only the 1900 FN. 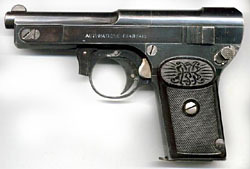 The FN Browning was the most successful pistol of its day, with wide distribution in Europe, and Martin chambered his gun for its cartridge, the 7.65mm Browning. However, the design that the Bernardon-Martin most resembles is the 1900 Mannlicher, with its fixed barrel, open-topped slide, and recoil spring beneath the barrel, though the Bernardon-Martin has a striker, like the Browning, rather than a hammer. Like the Mannlicher, the early variant of the Bernardon-Martin had an internal magazine that was loaded through the open breech. The Bernardon-Martin is blowback operated, with no locking or delaying mechanism. I have been unable to detect any influence from other pistols of the era. Huon states that: “The grip frame and barrel are machined from a single block of steel.” This is incorrect, though someone examining the gun only superficially, reading the patent, and examining the patent drawings might make a similar deduction. In reality, the grip frame and the upper receiver/barrel are separate pieces, each precision machined from separate blocks of steel . Huon also states that the gun has a cover plate on the left side which provides access to the mechanism. This is an inaccuracy that could only stem from not having the opportunity to disassemble the gun in person--the two screws that attach the grip frame to the receiver might give the illusion of a side plate if one were unable to remove the grip plate or were working from photographs or patent drawings. The breech block has two arms that extend forward beneath the barrel, forming a slide. The arms have lugs inside to lock them to the receiver, and they are flexible so that they can be spread apart and fitted onto the receiver from the rear. At the rear of the breech block on each side is a raised area with 16 triangular-cut serrations to aid in retracting the slide. A backstrap piece covers two flat springs, one to tension the sear and another to tension the manual safety lever. for the first time was that I had never seen an automatic pistol with so many screws on it. Two screws connect the grip frame to the upper receiver. The rear screw also passes through a hole in the upper portion of the backstrap. Another screw attaches the lower portion of the backstrap to the grip frame from the rear. A screw at the front of the gun, just beneath the barrel, passes through both arms of the breech block and through a block that retains the recoil spring beneath the barrel. This block has a short recoil spring guide rod attached to its rear. The manual safety lever is retained by a screw on the right side of the gun, as is the extractor. On the bottom of the breech block, a tiny screw holds the end-piece that retains the striker and striker spring. The extractor is a piece of machined steel, curved and with a hook on one end and a hoop of metal at the other end where the screw holds it, tempered into a spring. The firing pin serves as the ejector. The only disconnector is a spring-loaded tongue on the back of the trigger that slips past the front crossbar of the connector when the trigger is fully depressed, allowing the connector to return as the gun cycles. When the trigger is released, the tongue flips up enough to allow it to pass beneath the crossbar and engage the connector again. Until the trigger is released, it is effectively disconnected from the sear. This mechanism is independent of the position of the slide. There is a tail on the sear that extends to the rear of the gun. The tail mates with a slot in the bottom of the slide--when the slide is pulled all the way to the rear and the connector bar is pressed backward (with one’s third hand), the tail catches in this slot and holds the slide open. This was difficult to operate, particularly since it locked the slide at the maximum compression point of the recoil spring, and it is easy to understand why Bernardon eventually added a better slide hold-open device. The barrel incorporates a cartridge guide in the form of a small pin projecting just above the chamber, which fits into a hole in the top of the breech block. This cartridge guide is nearly identical to that of the 1900 FN Browning. 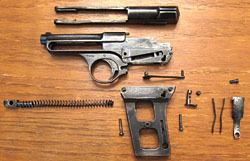 The connector bar runs from the trigger, which pivots on a pin, to the sear on the left side of the gun, and is held in place by the upper portion of the grip frame--the forward portion of the connector projects out from beneath the grip frame and is visible just behind the trigger. The manual safety locks the sear and hence the trigger, but not the breech. There is a half-round integral front sight and a V- shaped groove at the rear. The magazine on the second and third variant is of conventional design, with seven holes in either side for viewing the cartridges, and an additional hole on the right side for the latch. It holds seven rounds. The serial number is on the left side of the frame on the bow of the trigger guard. It is also stamped on the right side of the grip frame, beneath the right grip plate, on the inside of the slide, and on most small parts. The enlarged portion of the barrel, over the chamber, is stamped with the “BM” monogram in an oval cartouche. The grip plates are of checkered hard rubber with the “BM” monogram in an oval cartouche at the top. In 1908 Bernardon incorporated a company which he called Société Francaise d’Armes de St. Etienne, also known as Bernardon et Cie., in which he sold stock in order to raise money. 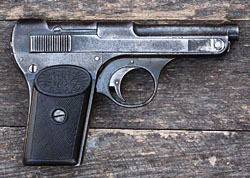 The major change to the Model of 1909 was that a slide lock lever was added in front of the trigger guard, tensioned by a small spring between the lever and the trigger guard. Two slots were cut in the bottom of the receiver on either side of the trigger guard bow. When the slide is drawn back while squeezing the locking lever, the lever catches the block that retains the recoil spring and locks the slide in the open position. This facilitated cleaning the gun. The serrations were eliminated at the rear of the breech block and replaced with steps that increase in height toward the rear of the gun--these enable the slide to be more easily retracted. The length of the recoil spring guide rod was extended. The shape of the front of the receiver, beneath the barrel, was changed, making it more squared off, rather than rounded. The Model 1909 is slightly longer and about 2.5 ounces heavier than the previous model. There are a number of minor variations, the order of which is uncertain. I believe the earliest Model 1909 guns still had a single screw at the front to secure the arms of the breech block to the the recoil spring guide block. I suspect that problems were encountered with this screw working loose, so a second screw was added, the only purpose of which was to lock the first screw in place so it wouldn’t come loose. Early guns retain the half-round front sight and a simple round barrel, whereas later guns were given a rib on top of the barrel and a squared-off front sight. Guns with the rib have the “BM” monogram stamped laterally over the chamber, rather than longitudinally. The serial number is moved to the bottom of the receiver, in front of the trigger guard. Some guns have the last three digits of the serial number stamped on the bottom of the magazine. The grip plates remain unchanged, as does the “BM” monogram on top of the barrel. Some of the Model 1909 guns were retailed by a local gunsmith shop in St. Etienne, known as Lapertot. These guns were engraved “ST ETIENNE” on a slight curve above the left grip plate and “LAPERTOT” above the right grip plate. According to Casanova, Bernardon had sunk all his cash into the enterprise, but his production was so low that he was unable to get any of the large distributors, such as Manufrance, to carry his gun. The Bernardon pistols were more expensive than the Browning and so had difficulty competing. Étienne Bernardon apparently closed his business and liquidated his remaining stock and parts in 1912. He may have sold his parts to Lapertot of St. Étienne, which was already selling the gun, though this is far from certain. Whoever bought the parts appears to have assembled a number of guns from them and to have sold them under the brand name “Hermetic.” According to Casanova, the Hermetic guns are all based on the Model 1909. The only photograph of a Hermetic pistol I have been able to locate is in the 1978 edition of Pistols of the World. It is marked “HERMETIC 7,65 ST. ETIENNE” on the left side of the slide. Hogg says, “the stamping of the word ‘Hermetic’ on the pistols is usually crooked, and does not match, either in style or execution, the remainder of the inscription.” The gun has the same grips as the earlier models, with the “BM” monogram. Apparently the left-over parts were mixed, because Casanova states that some Hermetic pistols have a single screw at the front of the slide, while others have two. The one reproduced in Hogg & Weeks has a single screw. serial number because it is on the bottom of the receiver. The highest serial number I have recorded is 3337. I have located photographs of at least one 6.35mm Bernardon pistol, which appears nearly identical with the patent drawing for Bernardon’s 10491 addendum to Martin’s original patent. The chamber portion of the barrel is marked on the left side CAL.6.35. The left side of the frame, above the grip, is marked SOCIÉTÉ FRANCAISE D’ARMES DE ST ETIENNE. The right side of the slide is marked AUTOMATIQUE FRANCAIS. The gun has a grip safety on the front of the grip and also features the slide lock on front of the trigger guard. * Please write to me if you have a Bernardon-Martin, a Bernardon, or a Hermetic pistol. I would greatly appreciate photographs, descriptions, and serial number information so I can make this article more accurate and informative. I am particularly keen to obtain detailed photographs of the two early variants of the Model 1907, and also of the Hermetic. French Patent 359992 for a “Pistolet Automatique” filed by Thomas Martin, rue Dubois, 3 Saint-Étienne, on 25 November 1905. Essentially the same patent was filed in England on 24 November 1906, titled “Improvements in Automatic Pistols,” and assigned British patent number 1906-26749. Austrian patent number 29358 became effective in 1907. So far as I can tell the French and British patents are nearly identical. The Austrian patent appears to differ somewhat, but I am not conversant enough in German to be more specific. The Austrian patent drawing shows the trigger, disconnector, and connector bar mechanisms in greater detail than the other patents. Martin’s British patent claims four unique features for his pistol: (1) a breech block with flexible arms that extend toward the front of the gun--what we today would call an open-top slide, but minus the usual crossbar at the front; (2) a frame with a fixed barrel designed to accept the breech block and “allowing its reciprocating displacement”; (3) a “push bar” connecting the trigger and sear; and (4) the sear itself, which was designed with two points, the front one to engage the striker and the rear one to be engaged by the safety. The functionality of the disconnector mechanism on the back of the trigger is not explained beyond its function in activating the connector and sear--possibly because the terminology was lacking. The French patent states, “La figure 3 représente la carcasse comprenant, en une seule pièce, le canon et le pontet.” This is rendered in the British patent as: “Figure 3 represents the framing comprising, in a single piece, the barrel and the trigger guard.” Huon says in his book, "La carcasse-poignée et le canon sont usinés dans un seul bloc d'acier." This translates as "The grip-frame and barrel are machined from a single block of steel." 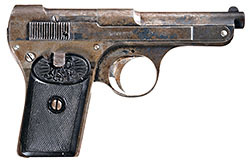 Unfortunately, Huon’s statement isn’t true, as the Bernardon-Martin is the only automatic pistol I have ever seen where the grip is actually a separate piece from the rest of the frame, but it is possible that Huon was basing his statement on the patent. easily be worth more than the gun due to its extreme rarity. French Patent 386646 for a “Pistolet Automatique” filed by Thomas Martin, rue Denis-Papin, 24, Saint-Étienne (Loire), on 29 January 1908. British and U.S. patents were also obtained in 1909 (British patent number 1909-1954 and U.S. patent number 935672). The patent describes a gun with a barrel that is dovetailed into the frame and held in place with a locking lever and with a grip safety on the rear of the grip. 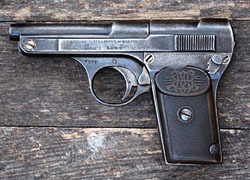 By this time the 1906 FN Browning, with its grip safety, was available on the European market, and Martin was clearly aware of it. addenda, no longer bears Martin’s name, we might deduce that the addenda represent Bernardon’s method of staking a claim to the gun. The additions comprise improvements to the connector and sear, and a grip safety on the front of the grip. The 2012 Standard Catalog of Firearms says that the second model of the Bernardon-Martin is like the first model with the addition of a grip safety Hogg and Huon both state that the grip safety was never implemented. The drawings in the first and third patent additions both show the bare outline of something on the front of the trigger guard that might be the slide lock lever, but it receives no mention in the text of the patent. No further patents were located for Thomas Martin. No further patents were located for Bernardon related to firearms, though he did patent a method of fabricating pedals for bicycles as late as 1930. “Le pistolet Bernardon, 1909,” by Daniel Casanova. Gazette des armes, No. 344, June, 2003. “Les 7,65 de nos grands-peres,” by Bernard Meyer. Gazette des armes, No. 194, October 1989. Les Pistolets Automatiques Francais: 1890-1990, by Jean Huon. Histoire & Collections, Paris: 1995. Pistols of the World, by Ian V. Hogg & John Weeks. Arms & Armour Press, London: 1978. Pistols of the World, by Ian V. Hogg & John Walter. Krause, Iola, WI: 2004. 2012 Standard Catalog of Firearms, ed. Jerry Lee. Krause, Iola, WI: 2011. Special thanks to Tom Knox for allowing me to examine and photograph his Model 1907.
and for providing information about his gun. His website is Pistolen der deutschen Wehrmacht. Copyright 2012 by Ed Buffaloe. All rights reserved.